Don’t turn your backs on us, Red 2 cast. It makes it much harder for us to tell who’s actually in this sequel when we can’t see your face! I mean, that’s clearly Bruce Willis in the middle … unless Helen Mirren recently shaved her head. And I’m fairly certain I can tell the difference between Catherine Zeta-Jones and Mary-Louise Parker, who appear to be flanking Willis. But who’s in the boots and shorts, with the machete behind their back? Malkovich? Either way, I like the streamlined, simplified approach to the sunset-red poster and the silhouettes of the cast. (though it does continue that annoying trend for 2013). 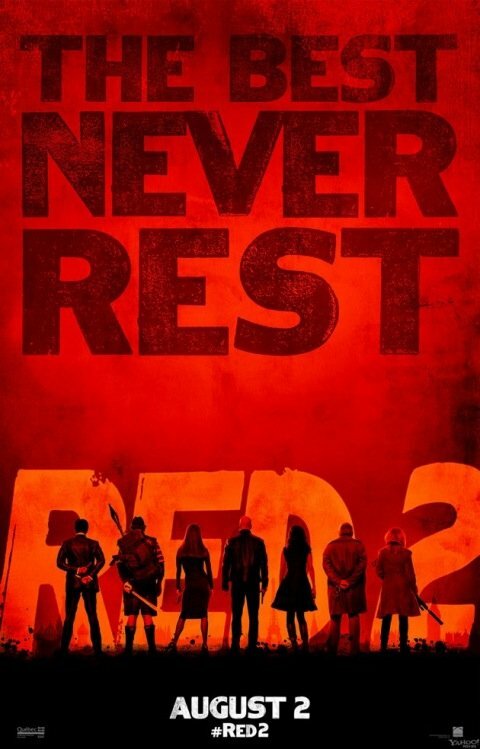 The new Red 2 poster was shared via Yahoo Movies. Would you want this on your wall? You see? Die Hard films aren’t the only sequels that manage to get Willis back into the fold. He’ll reprise the role of Frank Moses for this Dean Parisot-directed film, which catches back up with the retired assassins for a second adventure. In addition to the aforementioned actors, the sequel makes room for Sir Anthony Hopkins, David Thewlis and Byung-hun Lee (who I believe is on the far left of that poster). We ran a trailer earlier, showcasing some of the humor in the upcoming sequel. The original film was a bit of a surprise, earning $199 million at the global box office. Will audiences flock back to see the further adventures of this chemistry-laden ensemble? We’ll find out when Red 2 reaches theaters on August 2nd, opposite 300: Rise of an Empire and The Smurfs 2.